The Passive House approach is one of the world’s most ambitious, verified and practical way of providing energy efficient buildings. The Passive House approach differs significantly from all other low-energy houses in their emphasis on building envelope thermal performance. These houses incorporated R&D from many parts of the world including Canada (see Saskatchenwan Conservation House 1977 and subsequently the R-2000 program). 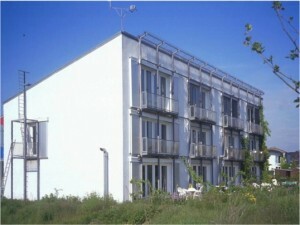 The first so-called Passive Houses were designed and built in 1990, in Darmstadt, Germany. Today more than 25,000 homes and buildings have been built to Passivhaus standards. Despite the referenced name to houses, the standard can be applied to many different buildings types, whether new, or renovated. The Passive House concept itself remains the same for all of the world’s climates, as does the physics behind it. Yet while Passive House principles remain the same across the world, the details do have to be adapted to the specific climate at hand. Raymond has taken CanPHI’s 5 day Certified Passive House Designer Course and is a member of CanPHI. Passive House Fundamentals (text summary courtesy of CanPhi). Since the amount of heat loss from any building envelope is proportional to its surface area, the building’s surface area must be minimized to achieve exceptional energy efficiency. Passive House designers use a ratio known as the ‘Shape Factor’ to assess buildings, this being the ratio of the building’s surface area divided by its volume. So buildings with sprawling designs, exposed floors, heated garages etc. have higher shape factors, and will therefore experience higher heat losses, even if their floor areas are identical. Passive solar gains normally form an important component of the heating requirements in a Passive House. In most regions of Canada high solar gains though south-facing glazing are potentially available and need to be utilized through appropriate design. At the same time, glazing on northern facades should be minimized. Both winter and summer shading performance, as well as year-round comfort design requirements are determined in detail using the Passive House design software (PHPP). The insulation levels required for any building to achieve Passive House performance must be determined by modeling the building using the PHPP software and relevant climate data. Depending on the climate zone, houses built in Canada will likely need between three and seven times better insulation performance than that provided by current national and provincial Building Codes, in order to achieve Passive House performance. The designer must ensure complete insulation coverage for all parts of the building shell (i.e. thermal bridge-free design). As the thermally weakest part of a building envelope, windows are a critical component, often representing 50% of all heat loss in a building. The quality of the windows is also critical to interior comfort, and in a Passive House the interior glazing and frame surfaces need to remain warm enough on cold nights to minimize interior cold spots and downdrafts. In all parts of Canada triple glazing is essential to achieve this, using two low-e coatings and argon (or krypton) gas fill, as well as insulated spacers. It’s also critical that window frames are insulated. Most windows currently sold in Canada meet few, if any, of these requirements. Passive House buildings must achieve very high levels of airtightness compared to conventional construction, in order to minimize heat loss from air infiltration, and also to protect the building structure against possible moisture damage. All Passive House buildings include a ventilation system which provides excellent indoor air quality and which has exceptional heat recovery performance. In order to certify a Passive House, the designer must demonstrate that all parts of the building fulfill a strict thermal bridge criterion. In practice, Passive House designers have developed a large number of appropriate thermal bridge-free construction solutions, and many of these are presented in CanPHI’s training course. Significant thermal bridging is found throughout all building envelopes in contemporary Canadian construction.